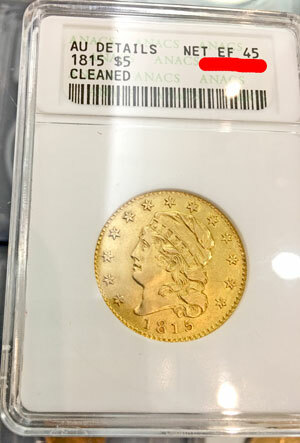 Visitors to the January Greater Atlanta Coin Show enjoyed spring-like temperatures on the outside and summertime temperatures on the bourse while they viewed coins and collectibles. Yes, in just a week's time, the metro Atlanta area went from freezing temperatures with icy conditions during the previous weekend to temps in the upper 60s to low 70s for the show day. But, on the bourse, the hotel's HVAC system poured hot air into the room. We requested the hotel's staff to address the issue. They responded with a service crew that worked several hours to correct the problem. Unfortunately, though, the room did not cool down until the end of the show. We apologize for the heat. We know some of our guests had difficulty coping and left the coin show. We hope you return soon to visit another of our shows. In general, we didn't have as many guests as we saw during the latter months of the year, but that compares to years past. People use January to recover from the holiday spending and celebrations, and with an added bonus during this show, they had the opportunity to enjoy a beautiful day outside. Nevertheless, we thank the many visitors who joined us. You are certainly appreciated. Similarly, the hotel was not as busy during January, but they did host five different church groups throughout the day. One group even provided food for their members. On the bourse, as usual, the dealers filled all the tables with their coins, currency, bullion, exonumia and other collectibles. Side note, exonumia are numismatic items other than coins and paper money such as tokens, medals, scrip, stock certificates, etc. Let's take a tour of just a few of the specimens seen on the bourse. But, before we do, several of the coins have a CAC sticker on their certified holder. What does this sticker mean? "Within each number of the coin grading scale is a small range of condition from low-end to high-end. Certified coins of the same grade can be of varying quality. Many of today’s collectors want coins that are solid or premium quality for their assigned grade. This early dollar, designed by Robert Scot, included a draped bust on the obverse, a small eagle on the reverse, and edge lettering to specify the denomination. The 1797 dollar had three different varieties, but the relatively new Philadelphia Mint produced less than 7800 of the coins. 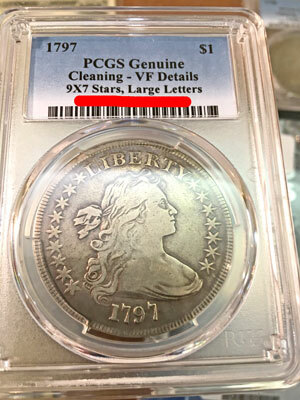 This particular version graded by PCGS (Professional Coin Grading Service) as "Cleaned with VF details" included nine stars on the left and 7 stars on the right with large letters. Frequently, coin designs used 13 stars or 13 bars or 13 other elements to recognize the original colonies. As our flag once included 16 bars for the 16 states in that timeframe, this coin also showed 16 stars in each of its varieties. As for the grade, cleaning old coins hurts their value, but the 1797 dollar coin with its low mintage and its age still brings a four-digit value even in grades below this one. The next coin is another draped bust dollar, but this one included a new heraldic eagle reverse, and the Mint chose 13 stars on both its obverse and reverse designs. In that year, the Philadelphia Mint produced less than 42,000 of the dollar coins with five different recognized varieties. The varieties included a 2 over 1, narrow date; a 2 over 1, wide date; a narrow normal date; a wide normal date; and a proof re-strike (only four known). This coin, an 1802 over 1 dollar graded by PCGS as VF-25 is one of two of the re-strike varieties. The two re-strike varieties hold similar values along the grading scale with the 2 over 1, wide date being slightly more valuable. Oddly, PCGS chose not to specify if this coin was a narrow date or a wide date. Moving on, the next coin on the bourse tour is an 1815 gold half eagle ($5) with a capped head facing left designed by Robert Scot and John Reich. This coin was just purchased at one of the auctions at the F.U.N. show earlier in January. Per the Red Book, of the 635 minted coins, only 11 are known to exist. Per PCGS, they believe 12 or 13 exist with most of them at museums or permanent private collections. In other words, a rare coin indeed. PCGS also comments that all specimens are in the AU or higher grade. ANACS (American Numismatic Association Certification Service) graded this coin as "Cleaned with AU details, net EF-45." In 1892, the Literary Century claimed "a good one of 1815 is worth $75." Similarly, the World Book of 1922 showed the 1815 Five-dollar gold piece valued at $100. Now, PCGS CoinFacts shows an MS-64 (a "good one") going for $460,000 in January 2009 and an MS-65 (an even better one) selling for $822,500 in February 2016. Our next coin is an 1859-D gold half eagle ($5) coin graded by PCGS as VF-35 with a medium "D."
This coin is a Liberty Head with no motto above the eagle. The Philadelphia, Charlotte, Dahlonega, New Orleans and San Francisco mint locations produced these half eagle coins. Note, the "D" mint mark is for Dahlonega not for Denver as is seen on more modern coins. Per David Akers on the PCGS CoinFacts view of the 1859-D coin: "The 1859-D has the second lowest mintage of any Dahlonega Mint Half Eagle yet surprisingly, it has appeared at auction more often than some dates with much higher mintages. It is also more often available in AU or Unc grades than many other D Mint issues and I have seen several very choice mint state pieces. However, the 1859-D still must be considered to be rare in all grades and very rare in uncirculated conditions. All specimens I have seen are rather weakly struck on the hair curls around the face and on parts of the eagle. The rims are well rounded." As noted by the gold CAC sticker on the certified holder, this coin is a fine example of the VF-35 grade. This coin designed by Christian Gobrecht showed a Liberty Head on the obverse and an eagle on the reverse. The US Mint produced the coins at their Philadelphia, Charlotte and San Francisco locations with a total population of 65,744. At Philadelphia, the mint struck 22,563 or 34% of the 1860 quarter eagles counting both the Old Reverse and New Reverse varieties. Though, the quantities of each are not known, the value of the Old Reverse ranges from three to more than six times the value of the New Reverse. 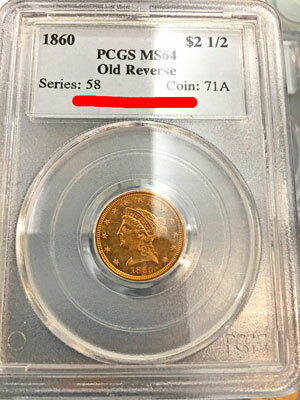 PCGS graded this particular version of the Old Reverse as an MS-64. On their population reports, they show 4 in this grade while NGC (Numismatic Guaranty Corporation) does not report any MS-64 versions of their Type I (Old Reverse) 1860 graded coins. In its age, rarity and grade, this coin moves into five-digits and is another beautiful gold coin from years ago. 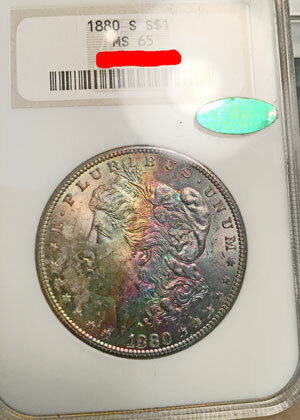 Moving on to the next coin, we see an 1880-S Morgan Silver Dollar graded by NGC as MS-65. In 1880, the third year of the Morgan Dollar, the US Mint made the coins at their Philadelphia, Carson City, New Orleans, Denver and San Francisco locations. Unlike the gold populations mentioned earlier, the total population for this silver dollar exceeded 27.3 million with San Francisco striking 8.9 million or just under 34% of the coins. That year, the US Mint had over ten varieties of the Morgan Dollar. At San Francisco, they had the regular strike; an 80 over 79 and a 0 over 9. This example is a regular strike that is beautifully toned, though not easily seen in the picture. Between NGC and PCGS, they have graded over 70,000 1880-S Morgan dollars as MS-65. 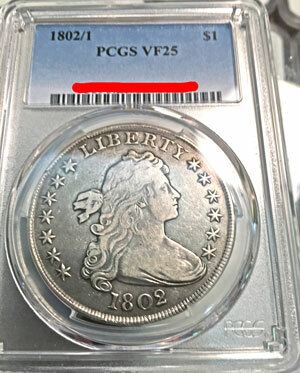 Plus, the two grading services have specified just under 30,000 of the 1880-S Morgan dollars at MS-66 through MS-69. 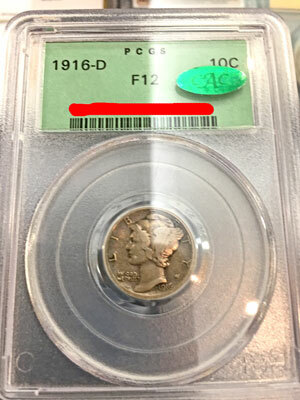 Our last coin for this month is a 1916-D dime certified by PCGS as F-12 with another CAC premium grade sticker. In 1916, the US Mint struck two separate designs - the last of the Barber or Liberty Head dime and the first of the Winged Liberty or Mercury dime. For the Barber, they minted just over 24 million combined at the Philadelphia and San Francisco mint locations. For the Mercury, the US Mint struck just under 33 million combined at the Philadelphia, Denver and San Francisco locations. However, of these, the Denver mint struck only 264,000 or less than 1% of the 1916 Mercury dimes. That makes this coin a "key" to the Mercury dime series. That ends the tour for this month. Join us on Sunday, February 12, 2017 for the next monthly coin show with its bourse filled with dealers and their displays of coins, bullion, currency and other collectible items. "CAC holds coins to a higher standard so you can be confident in the value of yours. We verify previously graded coins … and award our sticker only to those coins that meet the standard for today’s selective buyer. "CAC was founded by leading members of the numismatic community, including John Albanese, a respected authority on coin grading and the rare coin market." Now, for this month's series of "as seen on the bourse," let's go in date order. Those sales prices certainly exceeded the inflation rate from either 1892 or 1922. What cost $75 in 1892 would cost $2031.97 now. What cost $100 in 1922 would be $1458.24 today (using an inflation calculator). Even though this coin's grade shows it as "cleaned," which is undesirable, the five-dollar gold coin is still valuable due to its age, low mintage and estimated survival quantity. In other words, this is a nice and expensive gold five-dollar coin being shown on the coin show's bourse. It's a beautiful coin and displays George Morgan's design very well, however at these population numbers, its value is not extreme. That makes this coin affordable for its beauty, its silver content and its grade. Plus, its green CAC sticker means this coin is premium for its grade. "The 1916-D is rare in all grades. The original mintage of 264,000 for the 1916-D is by far the lowest of the Mercury dime series. The 1916-D is an extremely high demand coin in all grades and even very low grade examples sell for in excess of $1000. "Note that this is one of the most counterfeited of all U.S. rare coins. The bad guys add a 'D' to a 1916 Philadelphia. I have seen counterfeits in all grades and PCGS sees an average of 5 to 10 counterfeits a week. Needless to say, third party authentication is highly recommended." The first coin is a 1797 dollar, which was minted just a handful of years after the US Mint began operation. 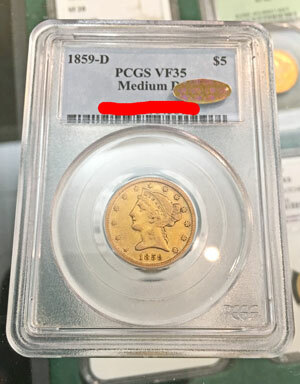 Take a look at this larger view of the coin's date and compare it to the Red Book pictures or visit the PCGS website to view their pictures of the die varieties. The next coin, another gold one but this time a quarter eagle ($2.50), is an 1860 example struck in Philadelphia with the Old Reverse.